Thithin the city centre, alla sightseeing places wihithin walking distance(car not necessary). <in very charming building dated 1927, our apartment is an idel location for those who wishes a quit and tasteful accomodation, central yet alm and fesh as it es surronded by old gardens. From the apatment , in only 5 /10 minutes walk, you will enjoy Como and its lake. Our apartment is also very attractive for businesmen, as is situaated close to the railway stati " Como Lago". Milano and Lugano ca be reached in 1 hour by train or car. Great location 10 minutes from city center. Apartment was very clean, well appointed and everything needed. Giglioti and Adriano were kind and excellent hosts. Many thanks for making our stay in Lake Como so enjoyable. 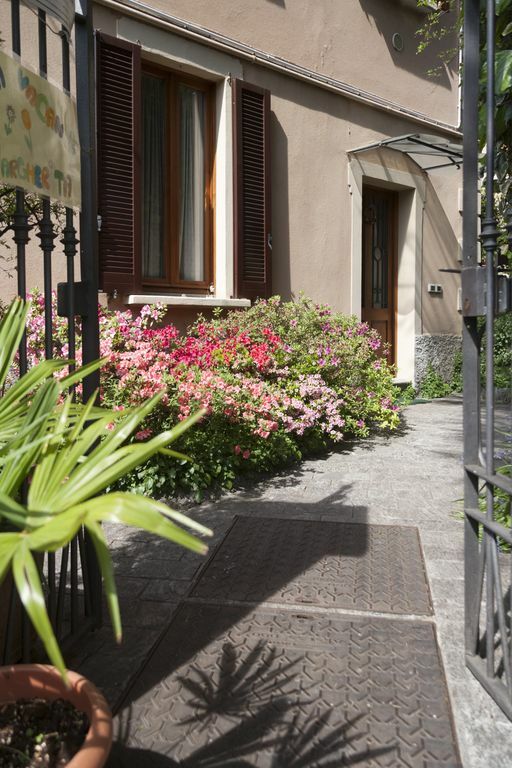 thanks for your friendly stay in Casa Margherita. You and your friend were kind, simphatique and polite. You stayed in our apartment like yours. The 2 bedroom apartment is in a residential area which provides a peaceful location away from the bustle of central Como. It is a 10 minute walk from the Lago Nord railway station, Duomo or Lake. The apartment is comfortable, nicely furnished and well equipped, with a full kitchen, a washing machine, and a small sheltered outside area. It would benefit from a second double bed instead of singles. There is very limited car parking in the area, but the owners reserved a car park for us close to the house. I would recommend using the railway to get to Como, as a car is not really necessary. Be aware there are steps and narrow doorways to negotiate to access this house, but this is normal for Italian houses. There are small friendly cafes and general store just down the road for the basics without the tourist prices. Owners Gigliola and Adriano live next door, and very kindly provided help and advice on places to go and how to get there. Overall an excellent base for exploring the greater Como area, with friendly helpful owners. We had a great time at Casa Margherita 2 in Como. It is a nice stroll to the centre of the city. Set in lovely gardens and surroundings, it felt very calming and was wonderful to hear the birds singing. It was ideal to be able to sit in the garden and enjoy a glass of complimentary wine. Thank you! Gigliola was very kind and helpful, explaining things well. She suggested restaurants and nearby supermarkets etc and kindly organised transport for us to Milan when we left. Many thanks Gigliola and Adriano! We hope to return. We are very happy that you have liked the enjoyable quiet and our little sweet smelling garden. You were a likeable , polite ed friendly guests. Gigliona and Adriano are the kindest of hosts! Even before you enter their home you notice the inviting patio calling you for wine and cheese or whatever suits your fancy plus the gardens are beautiful and an obvious labor of love. Once inside you notice the welcome of the front entry and then the spaciousness of this beautiful apartment - you feel at home immediately. There is obvious care and attention to detail in every room from the generously prepared kitchen to the comfort of all rooms. I really loved the hand soap in the bathroom - small things make a difference too! We walked everywhere and hiked the back hill one morning (e.g., 80 floors according to my phone app), ate great food and drank great wine. Gigliona and Adriano are wonderful and caring hosts in a beautiful place worth staying for as long as you can get away! Thank you Gigliona and Adriano! thanks su much for your kind review. We are very happy that our guests enjoed their stay in Casa Margherita. You were friendly and enthusiast about all, our home and also our flowers. You , your husband and your son were like a friend. All the great comments we had read prior to booking helped us make the right choice and everything was right on. We will stay longer on our next trip. 3 nights was just not long enough. The location was perfect. We walked everywhere. Gigliola was so welcoming and we knew if we needed anything at all we just had to ask. The apartment is spacious with a lovely view. we hope everithing is settled at your home. We are very happy that our guests enjoed the apartment and Como. Your family was simphatic , polite and friendly . I hope to see you again . We felt instantly at home in the apartment, especially after a very warm welcome from our hosts. We had everything we needed and our hosts gave us very useful information about the area and suggestions of things we could do. The villa was bright, airy and spacious and had a lovely view of the hills. The walk into the centre was no more than ten minutes and the area itself was quiet. We would highly recommend this property to other holiday makers. By car you can park around the house. Our apartment is very near the city centre, so car is not necessary.Guests can enjoy the Lake, go to Brunate by funicolare, see the Old town with splendid Romanic Churchs.It's beautiful walk along the romantic lakeside promenades(Villa Olmo and Villa Geno).From P.za Cavour guests canleave by boats and enjoy an unfogettable day, seeingthe beautiful towns of Menaggio, Bellagio, Varenna e Torno. Como is also THE CITY OF SILK, where guests can find the best italian style. Milano and Lugano(Switzerland) can be reached in 1 hour by car or train.